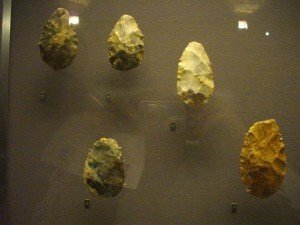 One of my earliest memories starting out as a first year archaeology student at the University of the Witwatersrand (Wits) in Johannesburg is of rooms and corridors piled high with small wooden boxes, many of which were heavily laden with so-called acheulean handaxes. They just seemed to be everywhere; there were even a few knocking about in the students’ coffee, I mean study, room. These distinctive stone tools were named after an archaeological site in Saint-Acheul, now a suburb of the northern French city of Amiens, where they were first described as stone tools in the mid 1800s. Earlier this year I visited Saint-Acheul and other related archaeological sites in the area. It is not any particular passion for stone tools I wish to share now, but rather the importance of these sites in the history of archaeology. More specifically, the place of this class of stone tools in the developing understanding of humanity’s history during the nineteenth century. Today we may take for granted that stone tools were manufactured by humans during what is called the Palaeolithic but up until the mid nineteenth century antiquarians and geologists clung tenaciously to a pre-Darwinian view of human history. It is generally accepted that it was an English antiquarian by the name of John Frere who in 1797 was the first to suggest certain stone implements he found in Hoxne, Suffolk, were made by humans before the use of metals. Given that the furore over Darwin’s Origins of Species was yet to get into full swing it is not surprising that Frere’s ideas were rejected. In 1830 Jacques Boucher de Crèvecœur de Perthes, a customs officer – and an avid antiquarian in his spare time, living in the northern French town of Abbeville, began exploring the gravels of the Somme River. He was certain that some of the stones he found were shaped by humans, that they could not have been so formed naturally. Also, quite crucially, these stones were found together with the fossilised remains of elephant and rhinoceros, long since extinct from these parts. For various reasons his ideas were not widely accepted. One of Boucher de Perthes’s critics was a doctor living in the nearby city of Amiens. 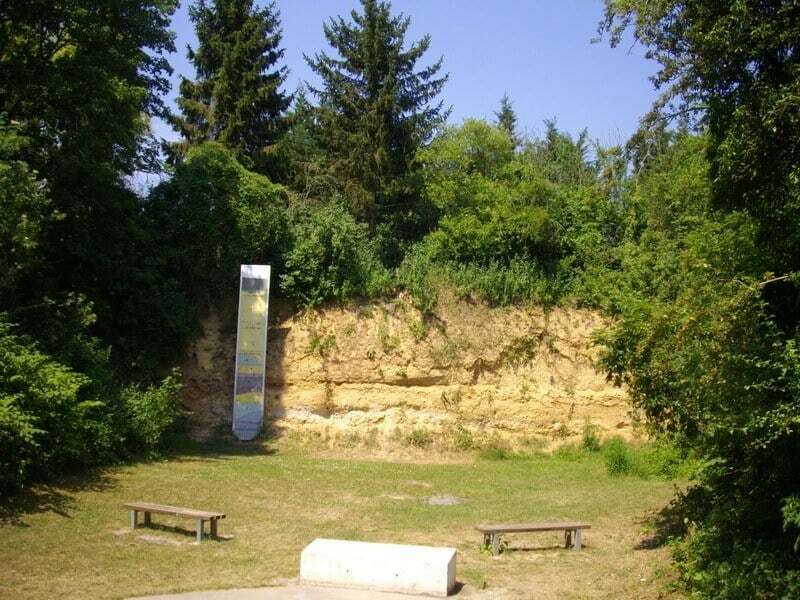 But as Marcel-Jérôme Rigollot explored the ancient river gravels of Saint Acheul in 1855, the geological age of the stone tools seemed beyond doubt. By 1872 the stone tools discovered by Boucher de Perthes and Rigollot had been fully described and said to belong to L’Epoque de St Acheul; and by 1925 this type of stone tool was renamed the ‘acheulean’. Saint Acheul in Amiens from where the tools were first described is therefore the type-site for this stone tool industry, and industry that is found throughout Africa, throughout southern and western Europe and as far east as India and some suspected examples in China. 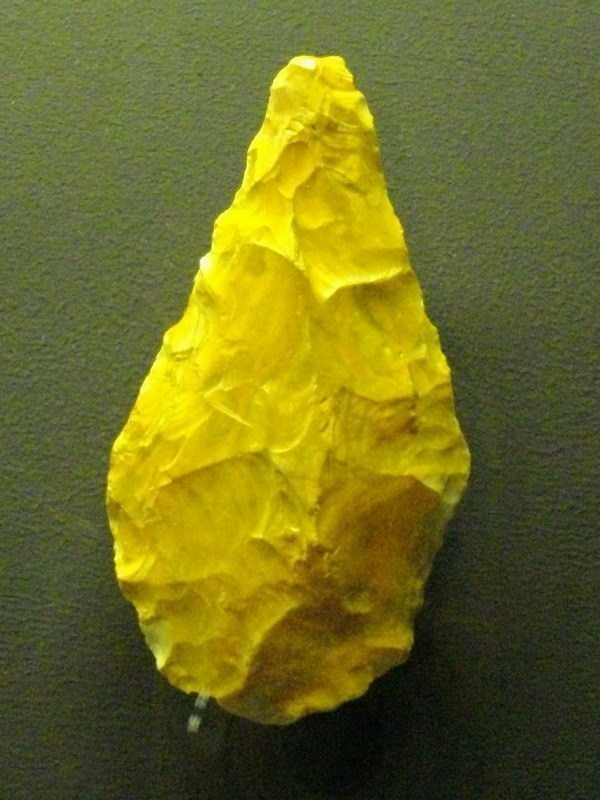 Acheulean hand axes were not made by Homo sapiens, but rather earlier ancestors of ours, starting with Homo erectus, and perhaps even early Neanderthal species. The naming and classifications of these early hominins is constantly being revised, but the tools were being used by human ancestors from about one and a half million years ago to about 100, 000 years ago (in Europe – they were no longer being used in Africa at about 250, 000 years ago). To many, the acheulean type-site might at first seem somewhat disappointing – given that the only feature to look at is an exposed side of a woody bank. But, as milestones in the history of archaeology go, the acceptance of the authorship and antiquity of stone tools must surely rank as one of the most important. The seemingly innocuous wall of soil from which stone tools were removed in 1855 has been preserved, and the city of Amiens has created a fitting ‘archaeological garden’, that not only honours its distinguished resident but also the significance of this place in the history of archaeology. The section of the gravels is exposed for all to see, and a board showing the different layers and their ages makes it an interesting visit for people with a specific interest in Stone Age archaeology. A visitors centre explains the significance of the site, and hosts events during summer. Otherwise the gardens are a great place to have a picnic; there are also tennis and basket ball courts, as well as a small field set aside for football. In Amiens city centre is the Musée de Picardie, one of the first purpose built museums in France. Understandably the museum has a few displays about Saint Acheul and its handaxes. But the museum has a wonderful set of displays that cover the entire archaeological past of this area that are well worth seeing. If you are visiting the Jardin Archéologique de Saint-Acheul for its historical significance, you really should not miss the Musée Boucher de Perthes. The displays maybe a bit ‘traditional’, a series of glass cases with many stone tools, but these have been quite interestingly arranged so that an archaeological novice can see how stone tools developed through the millennia. And included in these displays are some of the acheulean handaxes from Jacques Boucher de Crèvecoeur de Perthes’s collection; some that he found in sites near to Abbeville itself and some that Rigollot sent him from Saint Acheul. In 2010 it was discovered that the ground in front of the museum was an archaeological site. This has now been excavated, and the museum plans to redevelop its archaeological displays. Saint Acheul and the museums in Amiens and Abbeville may not very well be suited for children (although the Amiens museum has Egyptian mummies), for youngsters there is the amazing Samara prehistoric park just outside Amiens on the road towards Abbeville. Actually, if you like archaeology, this is one not to miss. The prehistoric park has a number of brilliant reconstructions (both indoors and outdoors) of houses through the ages, and here are often artisans demonstrating ancient crafts. The park is situated just below an Iron Age hill fort and next to the Somme River, near to which a number of prehistoric sites of all ages have been found. The greater Amiens area has not only been inhabited for many hundreds of thousands of years, from the early Stone Age, it was also a staging post for Caesar’s Roman armies as they set sail from the baie de Somme to conquer Britain. And it is this variety of archaeology that has made this an important area for the study of archaeology. These sites are well worth a visit.